3 Zero Conditional Uses: Use the zero conditional to talk about scientific facts, constant laws of nature, unchangeable rules, customs and personal routines. Formula: present simple, present simple Positive Example: If/When it is lunch time in London, it is breakfast time in New York. Negative Example: If/When it is not below zero degrees Celsius, it is not snowing. Notes: Either if or when can be used in the if-clause. First Conditional Uses: Use the first conditional to talk about probable/possible conditions in the future, or for threats or warnings involving direct action. Formula: present simple, future Positive Example: If it rains tomorrow, I will bring my umbrella. Negative Example: If you don´t like a food, don´t eat it. Notes: You can use an imperative in the main clause You can use the present continuous or present perfect instead of the present simple. 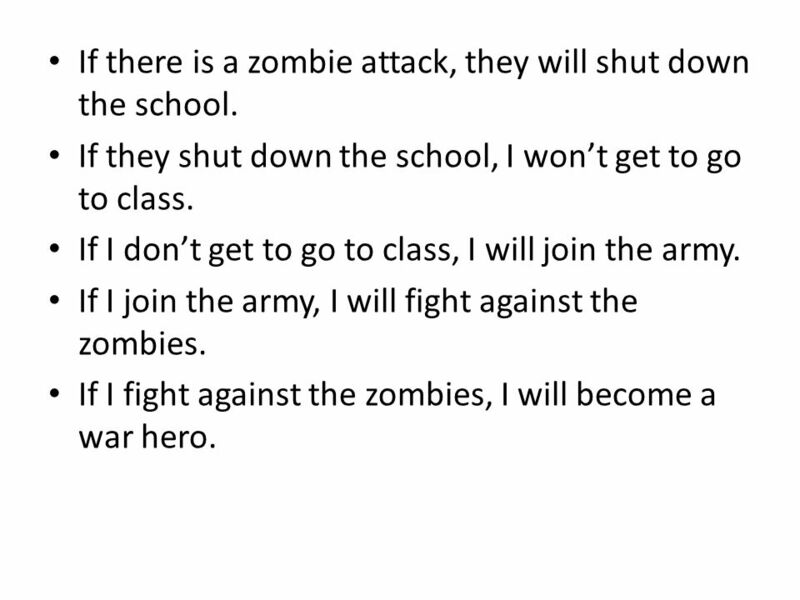 4 If there is a zombie attack, they will shut down the school. If they shut down the school, I won’t get to go to class. If I don’t get to go to class, I will join the army. If I join the army, I will fight against the zombies. If I fight against the zombies, I will become a war hero. 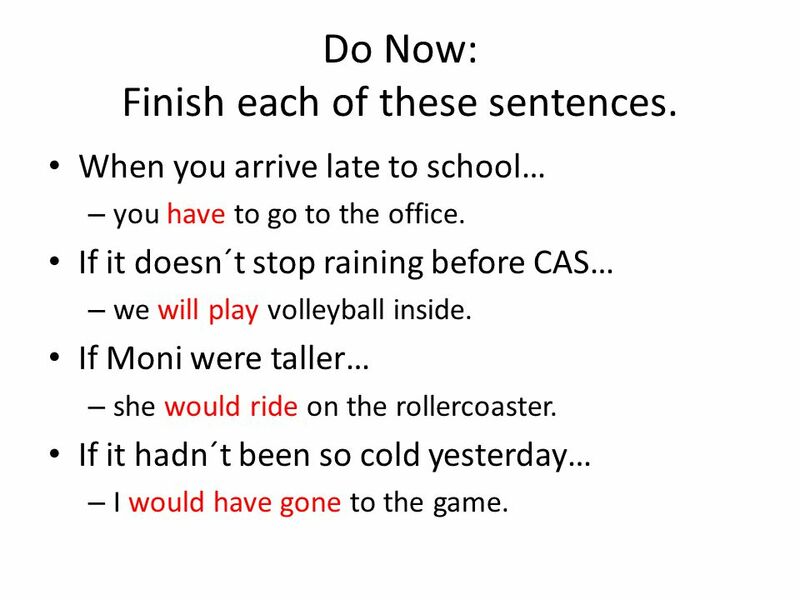 5 Do Now: Finish each of these sentences. When you arrive late to school… – you have to go to the office. If it doesn´t stop raining before CAS… – we will play volleyball inside. If Moni were taller… – she would ride on the rollercoaster. If it hadn´t been so cold yesterday… – I would have gone to the game. 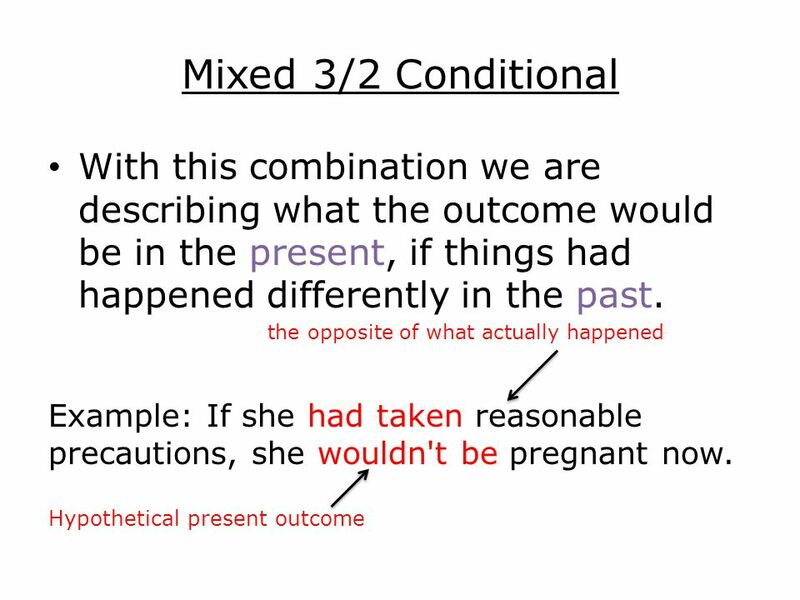 6 Second Conditional Uses: Use the second conditional to talk about unreal or hypothetical situations in the present or improbable events in the future. 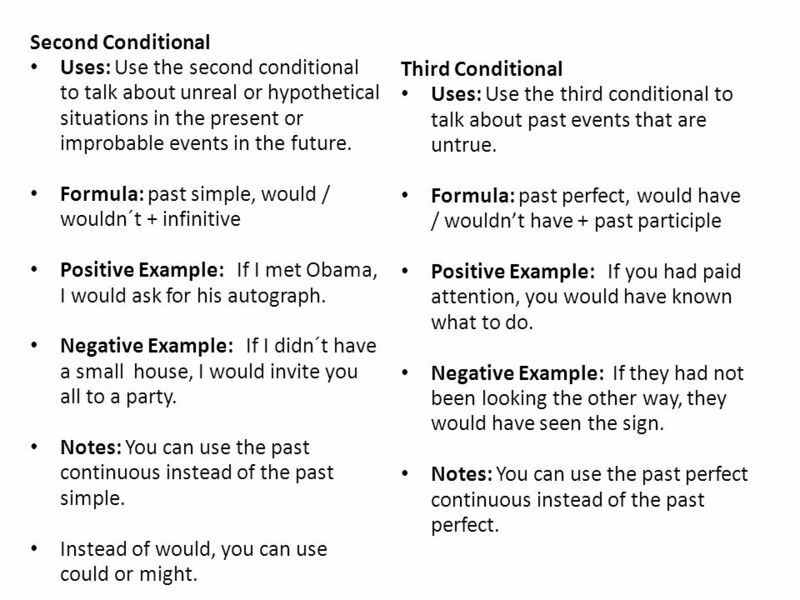 Formula: past simple, would / wouldn´t + infinitive Positive Example: If I met Obama, I would ask for his autograph. Negative Example: If I didn´t have a small house, I would invite you all to a party. 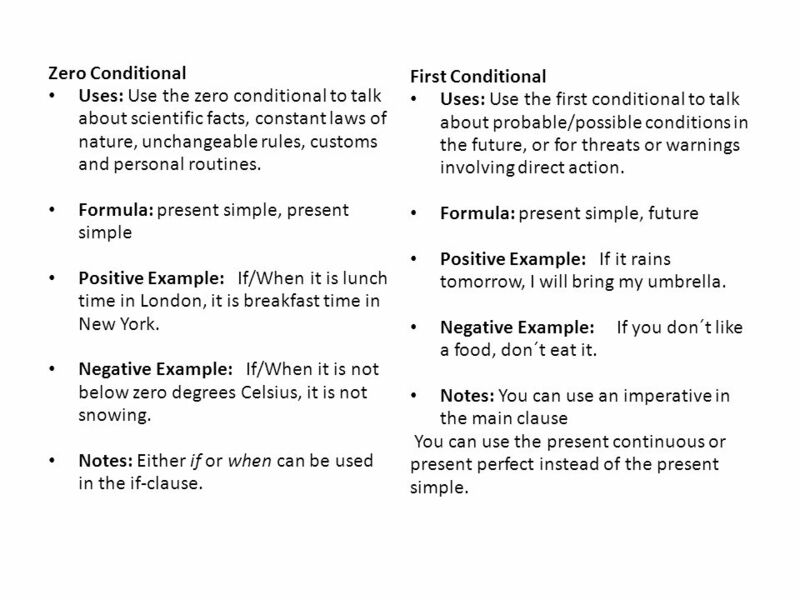 Notes: You can use the past continuous instead of the past simple. Instead of would, you can use could or might. 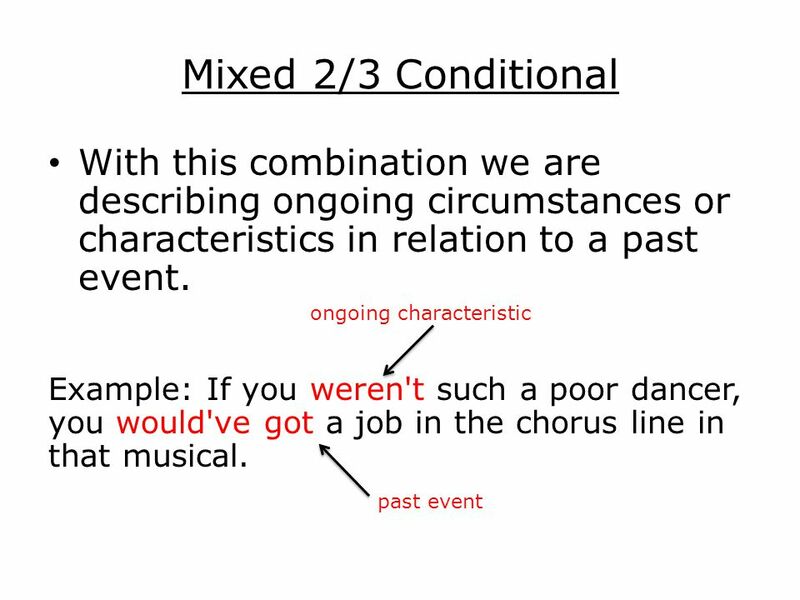 Third Conditional Uses: Use the third conditional to talk about past events that are untrue. Formula: past perfect, would have / wouldn’t have + past participle Positive Example: If you had paid attention, you would have known what to do. Negative Example: If they had not been looking the other way, they would have seen the sign. Notes: You can use the past perfect continuous instead of the past perfect. 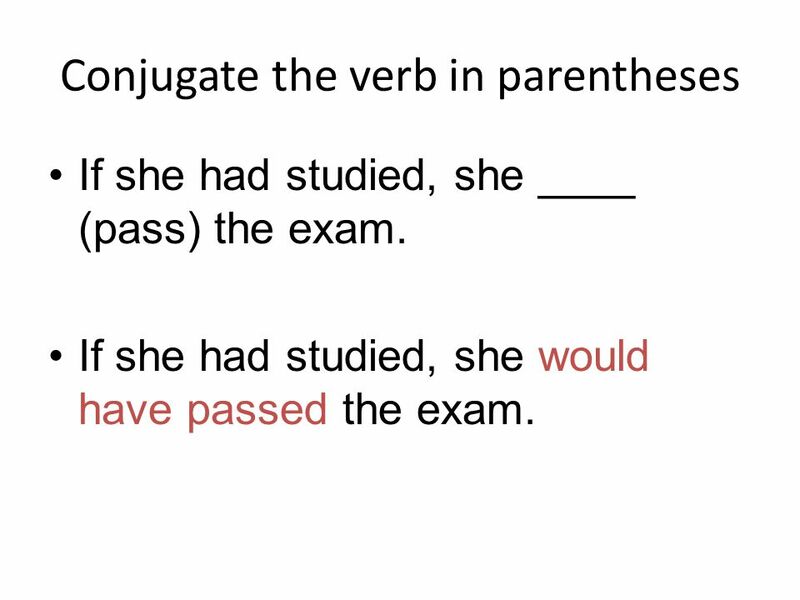 7 Conjugate the verb in parentheses If she had studied, she ____ (pass) the exam. If she had studied, she would have passed the exam. 8 Conjugate the verb in parentheses If I hadn't eaten so much, I ____ (feel) sick last night. If I hadn't eaten so much, I wouldn’t have felt sick last night. 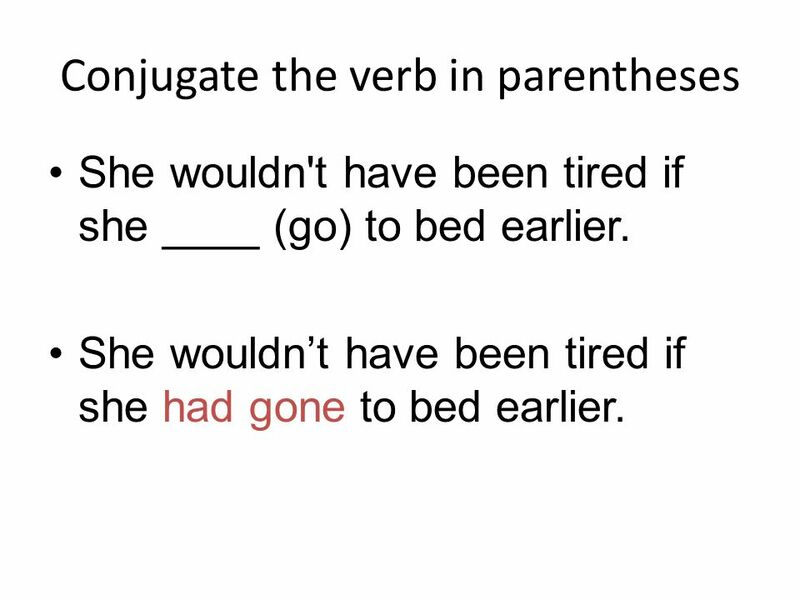 9 Conjugate the verb in parentheses She wouldn't have been tired if she ____ (go) to bed earlier. She wouldn’t have been tired if she had gone to bed earlier. 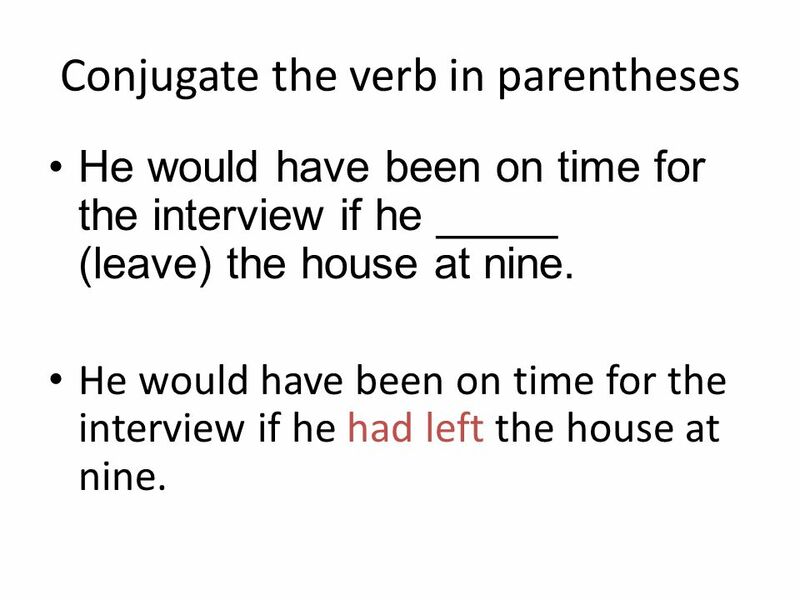 10 Conjugate the verb in parentheses She _____ (become) a teacher if she had gone to university. She would have become a teacher if she had gone to university. 11 Conjugate the verb in parentheses He would have been on time for the interview if he _____ (leave) the house at nine. He would have been on time for the interview if he had left the house at nine. 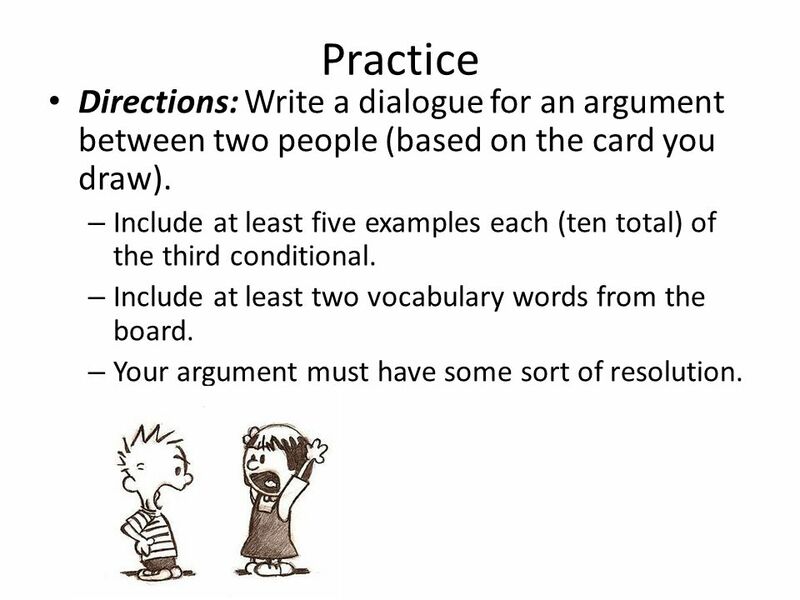 12 Practice Directions: Write a dialogue for an argument between two people (based on the card you draw). – Include at least five examples each (ten total) of the third conditional. – Include at least two vocabulary words from the board. – Your argument must have some sort of resolution. 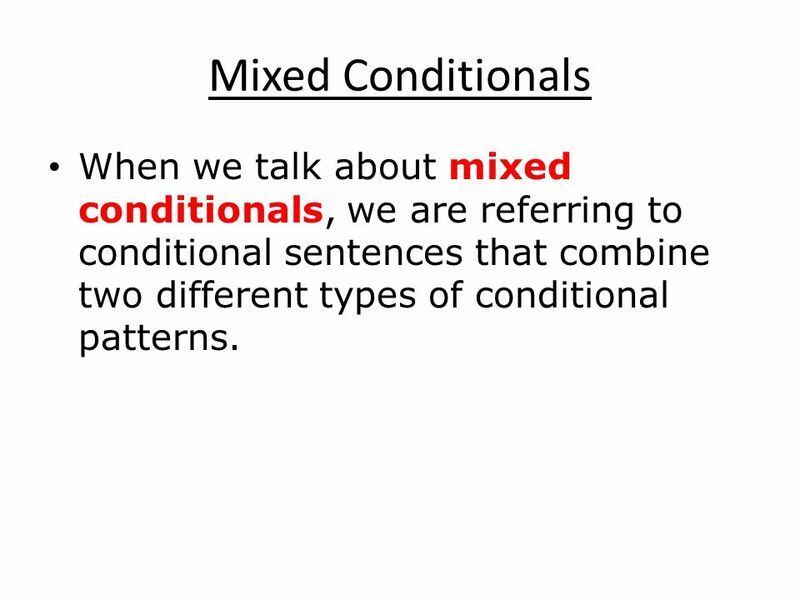 13 Mixed Conditionals When we talk about mixed conditionals, we are referring to conditional sentences that combine two different types of conditional patterns. 16 What is the difference between the third conditional and the mixed conditional? 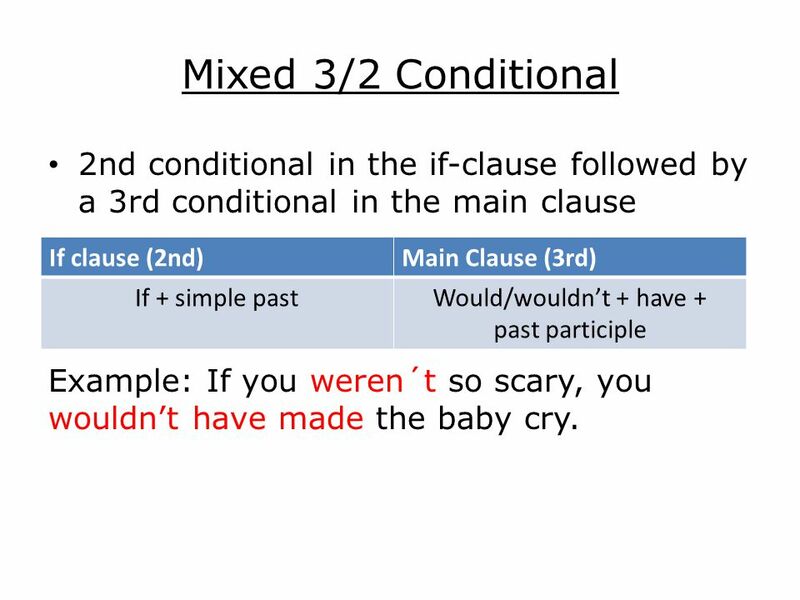 3 rd Conditional Describes what the outcome would have been in the past, if things had happened differently in the past. Example: If Vika hadn’t given birth to a unicorn, she wouldn’t have gone to the hospital last night. 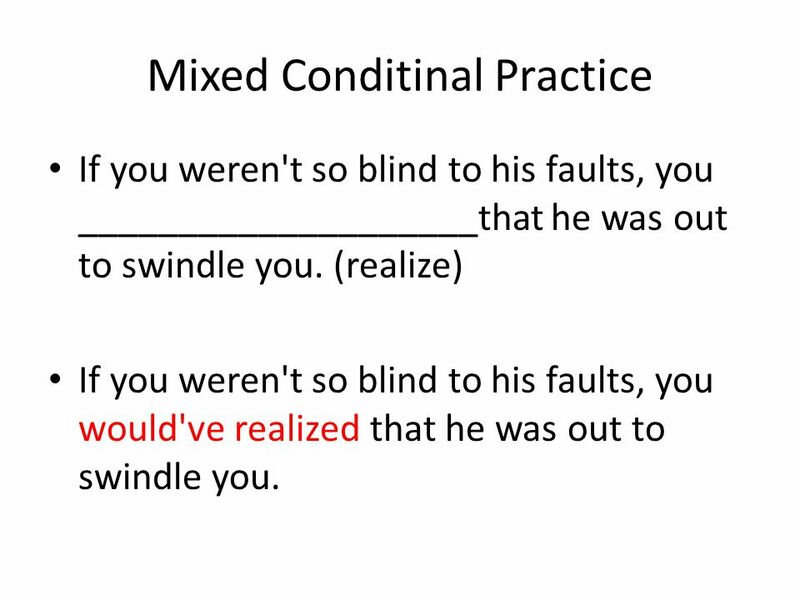 Mixed Conditional Describes what the outcome would be in the present, if things had happened differently in the past. 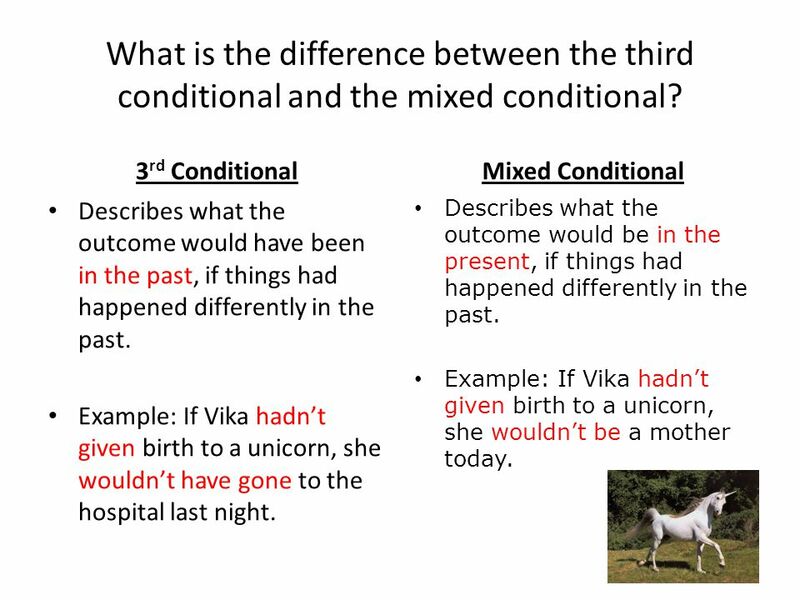 Example: If Vika hadn’t given birth to a unicorn, she wouldn’t be a mother today. 19 Mixed Conditinal Practice If you weren't so blind to his faults, you ____________________that he was out to swindle you. (realize) If you weren't so blind to his faults, you would've realized that he was out to swindle you. 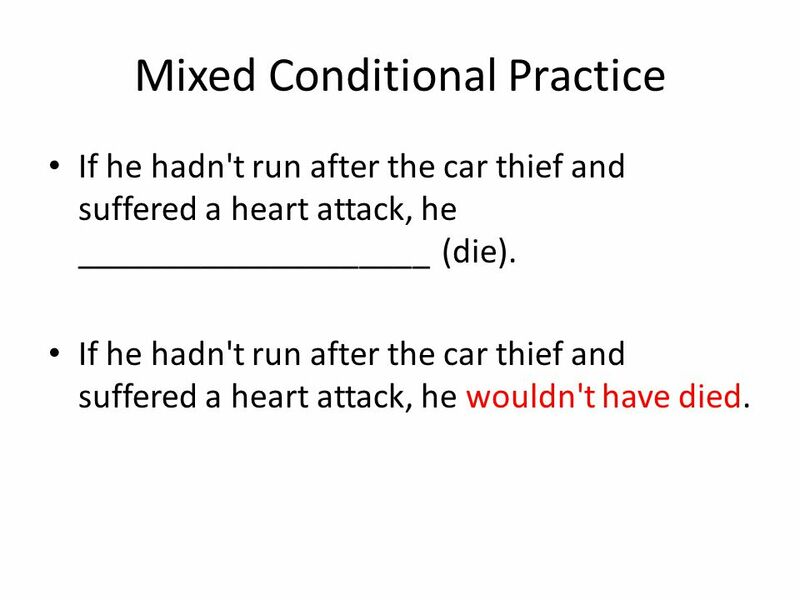 20 Mixed Conditional Practice If he hadn't run after the car thief and suffered a heart attack, he ____________________ (die). If he hadn't run after the car thief and suffered a heart attack, he wouldn't have died. 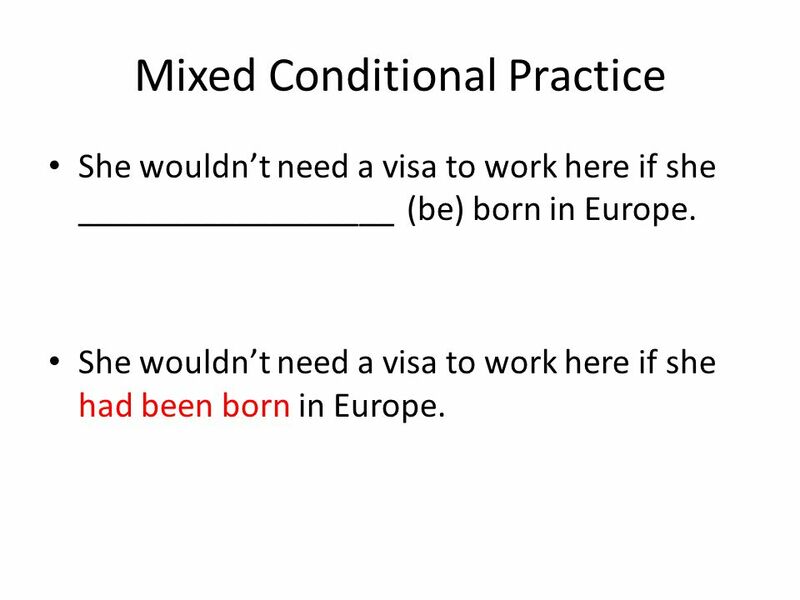 21 Mixed Conditional Practice She wouldn’t need a visa to work here if she __________________ (be) born in Europe. She wouldn’t need a visa to work here if she had been born in Europe. 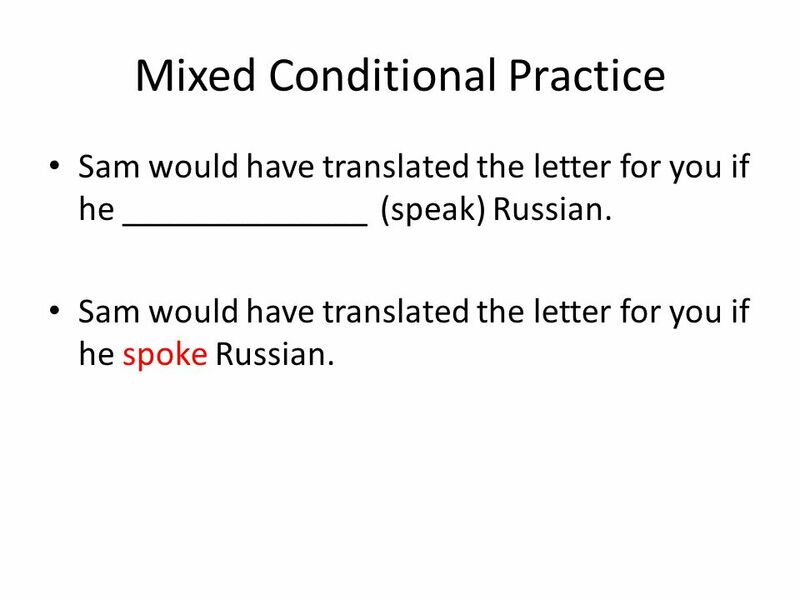 22 Mixed Conditional Practice Sam would have translated the letter for you if he ______________ (speak) Russian. Sam would have translated the letter for you if he spoke Russian. 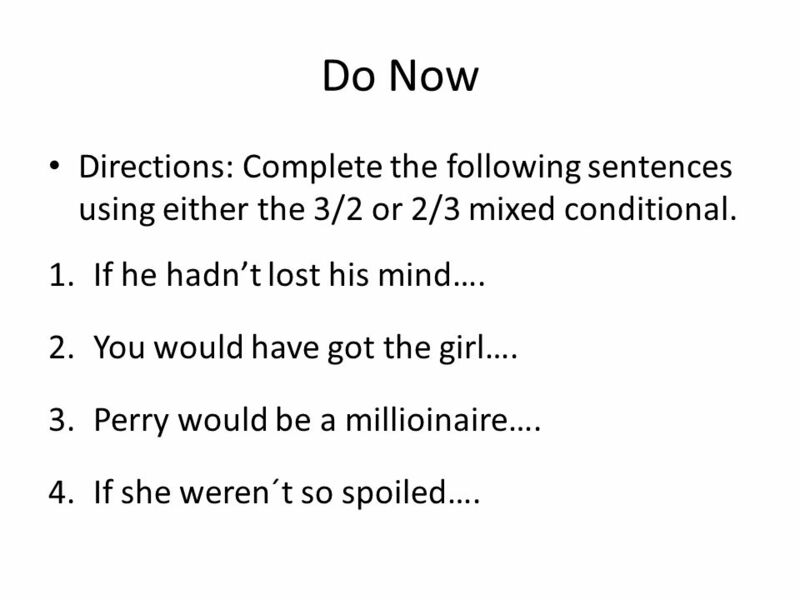 23 Do Now Directions: Complete the following sentences using either the 3/2 or 2/3 mixed conditional. 1.If he hadn’t lost his mind…. 2.You would have got the girl…. 3.Perry would be a millioinaire…. 4.If she weren´t so spoiled…. Download ppt "Conditionals. 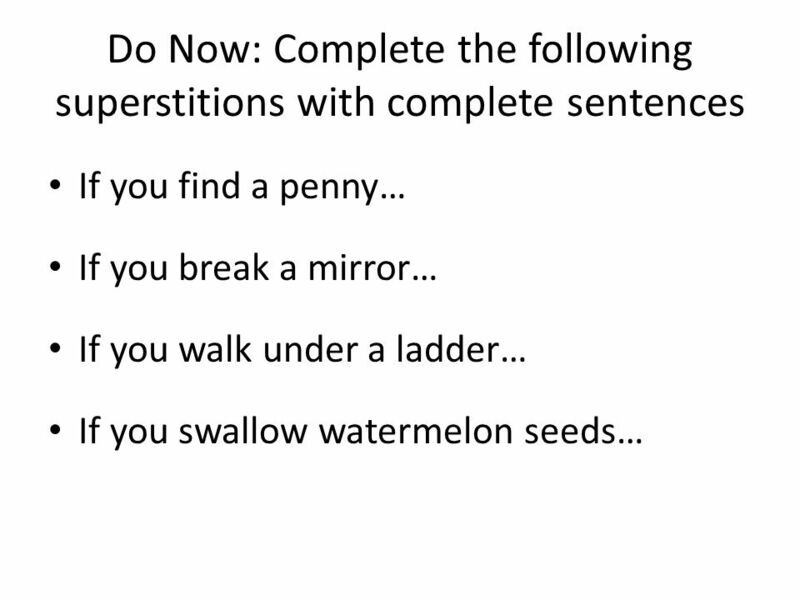 Do Now: Complete the following superstitions with complete sentences If you find a penny… If you break a mirror… If you walk under a ladder…"
IF CLAUSES ORAÇÕES CONDICIONAIS. Type Zero conditionals express a real or very probable situation in the present. They are formed as follows: Oração CondicionalOração. Perfect Infinitive with Modal verbs or Modal Perfect October, 2012. Have & Has Let's start with the basics. What would you do if.... Conditionals. 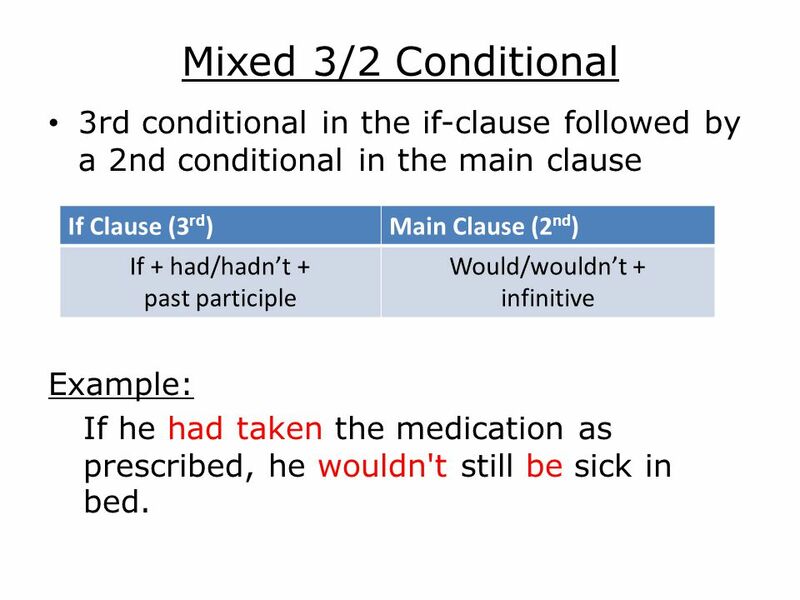 FOCUS ON GRAMMAR Often referred to as the "past" conditional because it concerns only past situations with hypothetical. First conditional If I buy a car, I won’t go to work by bus anymore. In the first conditional, the condition is a reasonable event in the present or future. 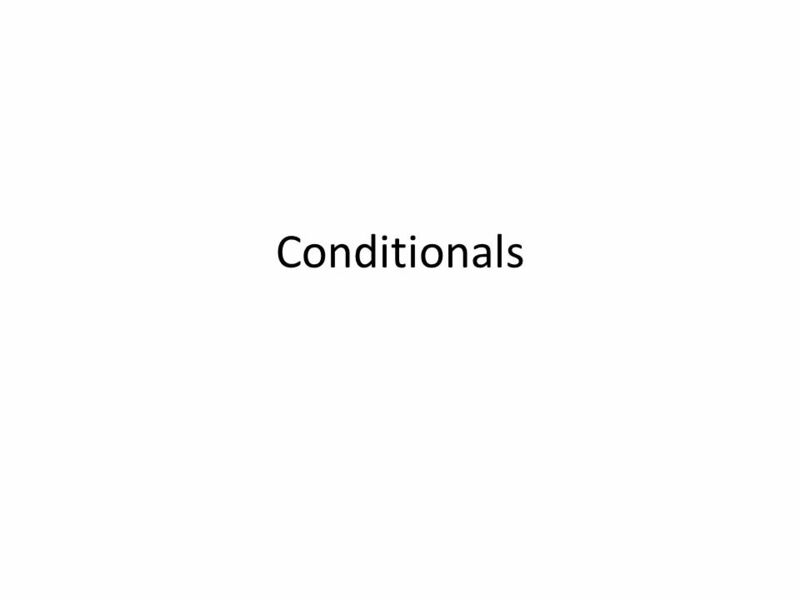 Unreal Conditionals. Type 2: Present or Future Time Reference. Číslo projektuCZ.1.07/1.5.00/ Číslo materiáluVY_32_INOVACE_175 Název školyGymnázium, Tachov, Pionýrská 1370 Autor Mgr. Eleonora Klasová Předmět.